Holy Cow, Batman! Vegan Indian Food at the Beverly Center! Well, not IN the Beverly Center, but right across the street across from Souplantation on 3rd St., just East of La Cienega. 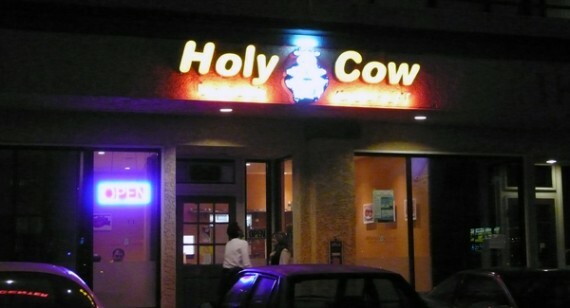 Holy Cow is an honest to goodness fast-food style Indian eat-in/carry-out kitchen with a range of veg and non-veg offerings. As is common with many Southern-Indian restaurants there’s no beef on the bill of fayre (probably due to quasi-Hindi leanings of its owners) which leaves an extra-large gap in the menu for vegetarian food, much of which is either naturally vegan or can be made as such. On our recent visit, we rolled up at 8pm on a Saturday evening, and made that classic mistake: allowing cell a couple of ‘phone babbling people to go into the restaurant ahead of us. By the time they’d figured out what they wanted to eat, changed it three times, and had any number of ‘phone conversations with friends about the menu selections, we’d been standing by the counter for a good 10 minutes. However, the experience was rather educational as we deduced the gang in front of us were somewhat observant Jewish people, most particular to ensure that there was no dairy in anything they ordered – in this way, we got a good grounder of what could, and could not be, veganized without having to go through a big Q&A with the person taking the order. When it was finally our turn, a very nice Indian gentleman of some stature and presence politely engaged with us, helping guide our choices. As is common with West Coast outlets like this (especially Indian), ordering a “dinner” is excellent value. For only a couple of bucks more than an a-la-carte single main dish one can get a appetizer, main dish, side of vegetables, rice and bread. Sadly for us, the naan bread contained eggs, so we had to order a-la-carte, even though a better economic decision might have been to order the dinner and trash the naan bread. But that’s not very vegan, now is it? 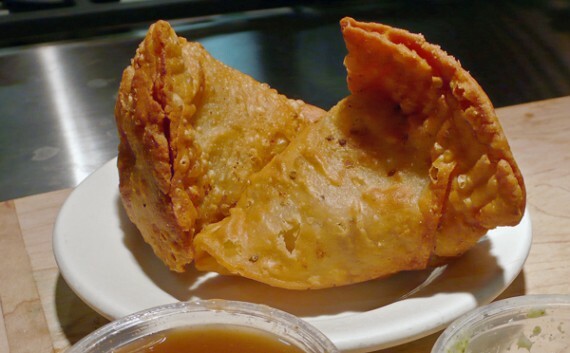 We started off with two Vegetable Samosas – at only $3.95 they were exceptional value and extremely tasty, being freshly prepared in the kitchen when our order was taken. They had that crispy outside with hot steamy inside that is so unique to this dish. 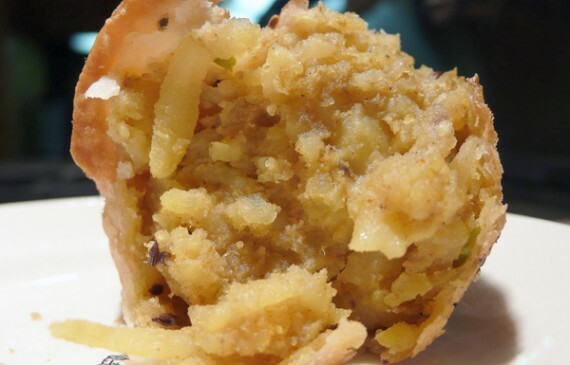 The nearest thing is a Chimichanga – that decadent Mexican-style deep-fried burrito, but I’d rather a samosa any day! I have a complete weakness for Potato and Cauliflower curries, particularly the Aloo Gobi which, if done right, can be a sublime dish. There’s something about the intersection of basic ingredients like vegetables, spices and oils that Indian cuisine does so well, and Holy Cow’s rendition holds up to the highest standards. 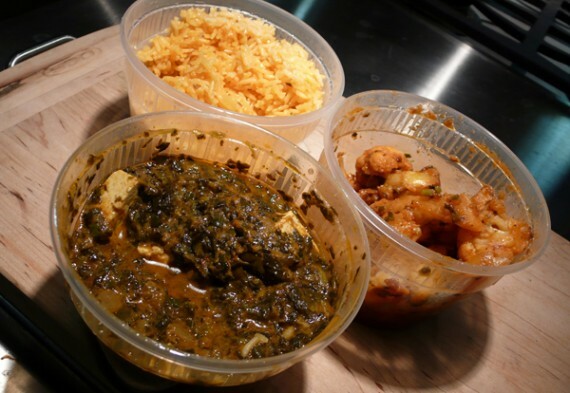 Our other entrée was Saag Aloo with Tofu – basically pureed spinach (spinach haters stop reading this paragraph now!) with chunky potatoes, spices and small, firm tofu pieces. This can very much be a hit or miss dish in many Indian restaurants because the cooking times of everything vary so much – seconds for the spinach, but 30 minutes or more for the potatoes and tofu, so a juggling act in the kitchen is needed to pull this delicate dish off to perfection – and whomever was back-stage at Holy Cow knows exactly how to make Saag Aloo happen: the end result being perfection. Finally, we ordered White Rice, which was a bit misleading (albeit in a good way), because the rice was actually cooked in herbs and spices, including turmeric, which gave it a yellowy look and, spicy flavor that complemented the food perfectly. 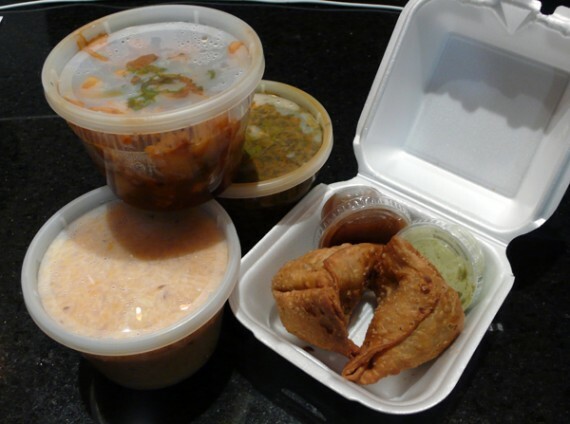 So, bottom line, Holy Cow was a GREAT, inexpensive Indian take-away very much in the tradition of my homeland in England where you can take home the curry or sit in a brightly lit restaurant and eat it there. Holy Cow has the ambience of a vegan Thai restaurant, but the food is so much better. With convenient parking, incredibly polite and helpful staff as well as completely above-average food, you can’t go wrong. The only competition is Samosa House, which is distant competition both in miles to travel (it’s in Culver City) and taste of the food. Thanks for being there, Holy Cow, and thanks for understanding about vegans and our standards. We’ll be regular customers.